My favorite aspect of my practice is explaining complex legal concepts to my clients and to members of the public in a warm and comfortable manner. I often joke that because my parents were both teachers, teaching is in my blood. 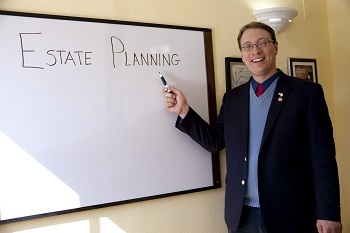 During client meetings, I jump up to the whiteboard to explain various aspects of estate planning, trust administration, probate, asset protection planning, and elder law planning. The response is always very positive. I strongly feel that legal concepts should be accessible to everybody and I have developed a knack for making these concepts easy-to-understand. Through technology, I am able to share these “famous” lessons with you. Each video provides a brief description of its content. Please feel free to share these videos with your family and friends. I am not a professional teacher but use the term, "The Legal Teacher," to convey my unique ability to explain legal concepts. I am only licensed to practice law in California. These "lessons" are for general information only. Watching these lessons does not create an attorney/client relationship. You should consult a qualified attorney licensed to practice law in your community before acting on any of the information presented in these videos or provided anywhere else on the website. For more information, please read our law firm's full disclaimer (see the link at the bottom of the page). IRS Circular 230 Notice: To the extent that the videos below or any of the information on this website concern tax matters, the information is not intended to be used and cannot be used by a taxpayer for the purposes of avoiding penalties that may be imposed by law. In this segment, Kyle explains what a Revocable Living Trust, how it works, and how it benefits you and your family. In this segment, Kyle explains the concept of “step up in basis” for capital gains assets such as real property and stocks. Kyle also explains how it is often advantageous for married couples to own joint property as Community Property rather than as Joint Tenants due to a unique quirk in the tax law. In this segment, Kyle explains the importance of transferring assets to a Revocable Living Trust in order to ensure that the trust avoids conservatorship, probate, or other administrative problems. In this segment, Kyle explains how a Common Pot Trust ensures a fair distribution among beneficiaries who are a few years apart in age. In this segment, Kyle explains how passing your inheritance through a “Beneficiary Controlled Trust” rather than through an outright or direct gift can provide your beneficiaries with additional protections from divorce, lawsuits, and future estate tax. In this segment, Kyle explains how the Parent/Child Exclusion can preserve the California Prop. 13 property tax base and how your children must be careful in the administration of an estate in order to maintain the property tax base. In this segment, Kyle explains the difference between a Revocable Living Trust and a General Durable Power of Attorney and why you need both documents. In this segment, Kyle explains how an LLC (“Limited Liability Company”) can provide asset protection from “inside creditors” and “outside creditors,” and explains the benefits of forming an LLC under the jurisdiction of a “charging order only state”. In this segment, Kyle explains how owning life insurance through an Irrevocable Life Insurance Trust (“ILIT”) can help reduce the size of your taxable estate, thereby reducing or eliminating estate tax upon your death. In this segment, Kyle explains the concept of a “stretch IRA” and how your beneficiaries can maximize the tax benefits of an IRA with proper planning.